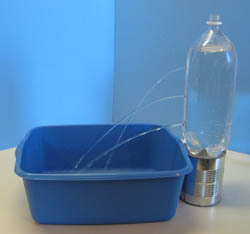 These kids science activities use inexpensive and recycled materials for a fun science activity about water pressure. In these activities kids will see how far water under pressure will shoot out of small holes in the side of a pop bottle. Have an adult help you make three holes in the side of the 2-liter pop bottle. The three holes should be about 2.5 inches apart. Make the lower hole about 2 inches from the bottom of the bottle. Cover the three holes with tape so the water will not leak out. Fill the bottle with water and recap the bottle while setting up the experiment. Place the plastic container in an area that will not be affected if some of the water leaks during the experiment. Place the tin can next to the container and the pop bottle on top of it. Make a guess as to which hole will shoot a jet of water the farthest? Remove the lid from the top of the pop bottle. Pull the tape off so the holes are exposed. If you are having trouble making the activity work it might be because you left the top on the bottle. Watch how the streams of water change as the water pressure decreases. Water pressure increases as you go down in depth. That is why the water pressure at the greatest distance. As the water pressure decreases the water jets decrease in length until they stop flowing. Towns with water towers use this same principal to move water from the tower to homes and businesses all around the town. The tanks are built to keep an entire days worth of water in the tank in case of an emergency. Free Science Activities, Spinning Colors Twirl a circle and watch the colors blend right before your eyes in this eye-catching activities. The links on this page include information science activities, science experiments, plate tectonics, the rock cycle and much more.